Find the notes of chapter Alkyl Halides based on the latest syllabus for UPSEE/UPTU entrance examination 2018. UPSEE aspirants always get 1-2 questions from this topic in the examination. About 45% of the questions are asked from Organic Chemistry in any engineering entrance examination. Students should understand the mechanics of all the reactions in organic Chemistry. If students try to do rote learning instead of understanding the mechanism, then they can’t answer the questions which are asked in the examination. The topic ‘Alkyl Halides’ plays an important role in securing good marks in Organic Chemistry. About 1-2 questions are being asked from this topic in the examination. In this article, we bring to you the notes of chapter Alkyl Halides including important concepts, chemical properties, physical properties and some solved questions for UPSEE/UPTU 2018. 1. These notes are prepared by Subject Experts of Chemistry. 2. Some solved questions are included in these notes to make engineering aspirants understand the concepts in an easier manner. 3. It will help aspirants to save their precious time while preparing for UPSEE entrance examination 2018. It usually requires a strong nucleophile. It is carried out in polar protic solvents (water, Alcohol, acetic acid etc.). 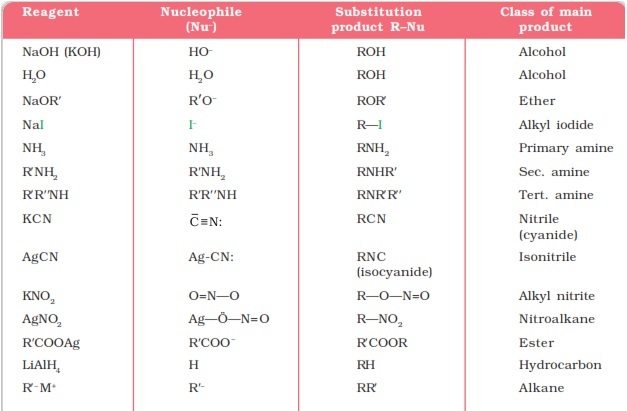 Which one is least reactive in a nucleophilic substitution reaction? Boiling point increases with increase in size of hydrocarbon part for the same haloalkanes. All the given haloalkenes contain same halogen atom i.e., bromine but the number of carbon atoms in hydrocarbon part of the molecule are increasing from ethane to benzene. So the boiling point is minimum for 1-bromoethane and maximum for 1-bromobenzene. Alkyl fluorides are synthesised by alkyl chloride/bromide in presence of ……or………. Alkyl fluorides are synthesised by alkyl chloride/bromide in presence of CoF2 or Hg2F2. Only transition metal fluorides react with alkyl chloride/bromide to form alkyl fluorides. Alkali metal fluoride such as NaF and alkaline earth metal fluoride such as CaF2 do not react to form fluorides. Students can easily understand about the preparation, chemical properties and physical properties of Alkyl Halides with the help of these notes. 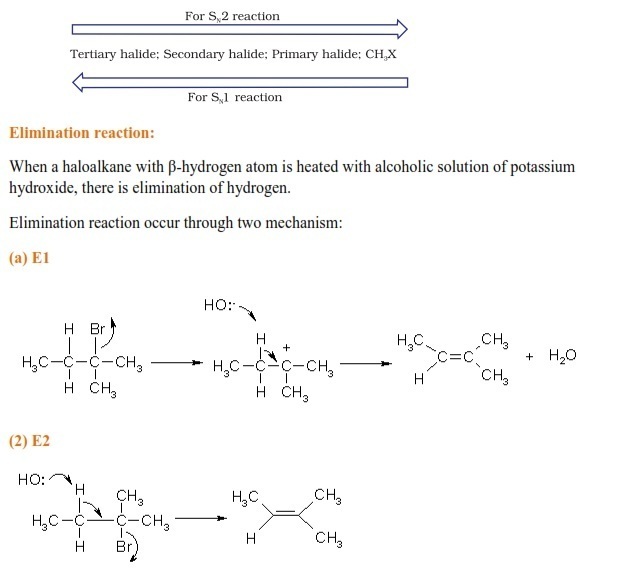 Also, it will help students in understanding the mechanism of name reactions related to Alkyl Halides.